MQTT is a messaging protocol designed for the Internet of Things (IoT). It is lightweight enough to be supported by the smallest devices, yet robust enough to ensure that important messages get to their destinations every time. With MQTT devices, such as energy meters, cars, trains, mobile phones and tablets, and personal health care devices, devices can communicate with each other and with other systems or applications. IBM® MessageSight is a messaging appliance designed to handle the scale and security of a robust IoT solution. MessageSight allows you to easily secure connections, configure policies for messaging, and scale to up to a million concurrently connected devices. 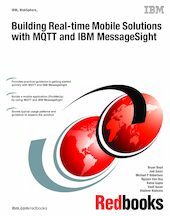 This IBM Redbooks® publication introduces MQTT and MessageSight through a simple key fob remote MQTT application. It then dives into the architecture and development of a robust, cross-platform Ride Share and Taxi solution (PickMeUp) with real-time voice, GPS location sharing, and chat among a variety of mobile platforms. The publication also includes an addendum describing use cases in a variety of other domains, with sample messaging topology and suggestions for design.